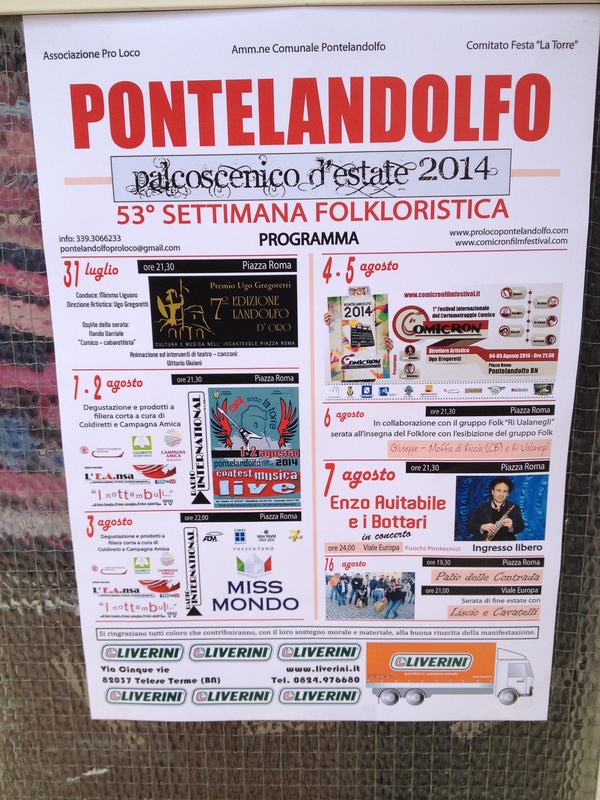 Pontelandolfo’s major festa is TOMORROW! The Festa di San Donato is the cornerstone of our little town’s tourism drive. 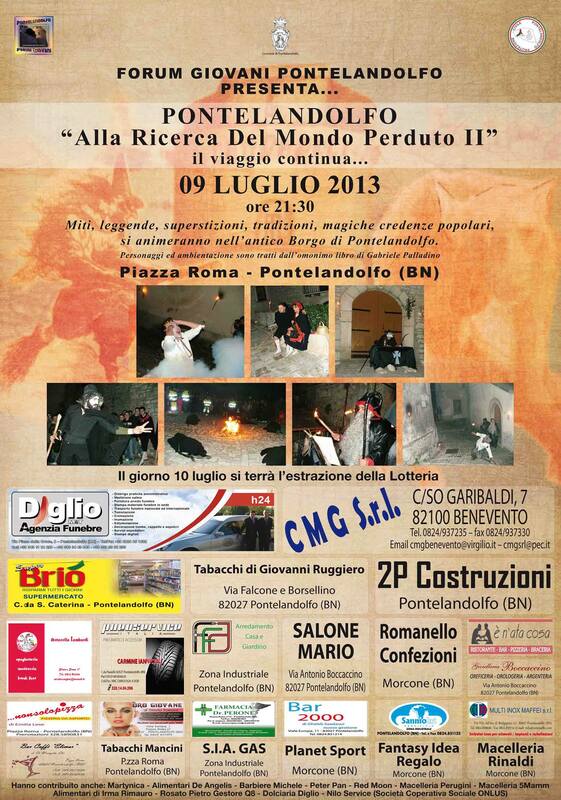 July 31 is the kick off and we will all be exhausted when the festa is over on August 7th. The finale is a concert with a headliner act and fireworks. The week long event has historically brought tourists and an infusion of cash into the town. I’m told that years past, buses of American tourists searching for their roots would roll in. The oldest church would be open – not with vendors but with artisans and purveyors of local wines and food products. This year, no one that I’ve asked as been able to tell me if that is happening. I’ve only been in the ancient church once, many years ago and would love to see the inside again. My favorite Pontelandolfo web-site, Pontelandolfo News, has a story on the church and the man. Practice you Italian and check it out http://www.pontelandolfonews.com/index.php?id=230. This is a religious festival but I can’t find a thing on any poster or web-site about when there is a mass or the procession. As a matter of fact, the town web-site doesn’t even list the churches. How could that be? Our famous tower – a vacation home for some out of towner who is never here. Want to see if we can buy it? This year, it looks like the town is prettying itself up for the week. I noticed men chopping down the weeds along the side of roads, the cement ditches are being cleaned. Thank you to all who are working so hard! 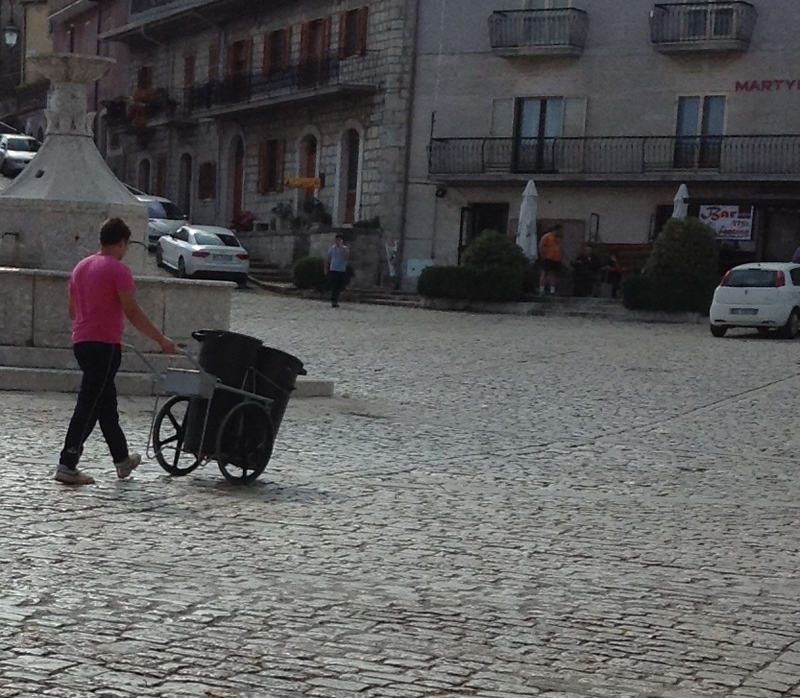 Normally every morning men clean the streets and the piazzas but this week I sensed a new bounce in their steps. 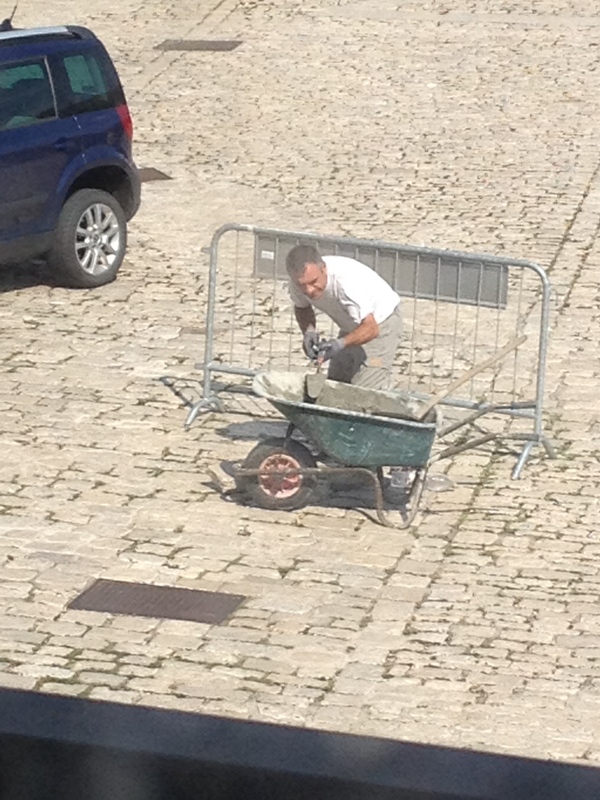 Every cobblestone is solid thanks to this man. No tripping in our town! There was a crew in front of Bar Mix Fantasy sculpting shrubs. I noticed new plants set up around the out door tables at Nonsolo Pizza. 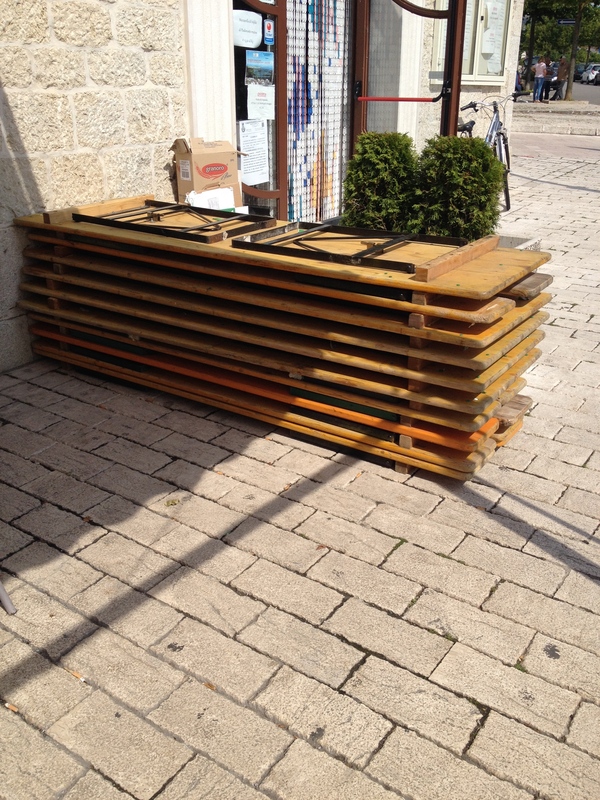 The portable tables and chairs are stacked by all the bars. The sun is shining and all hope it will shine from July 31 through August 7. Tomorrow, happy revelers will be sitting at tables! 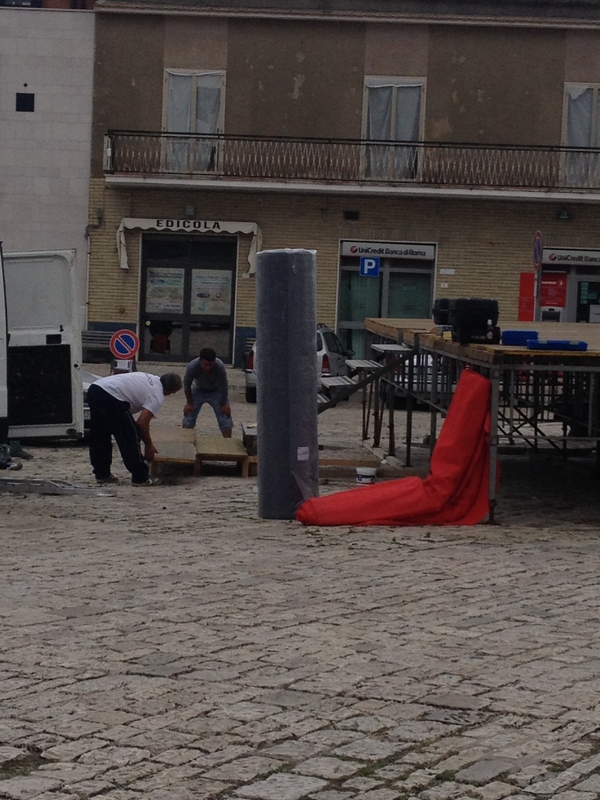 The other night we drove to Circello – a village about 30 minutes away and saw posters for the headlining acts plastered on walls. 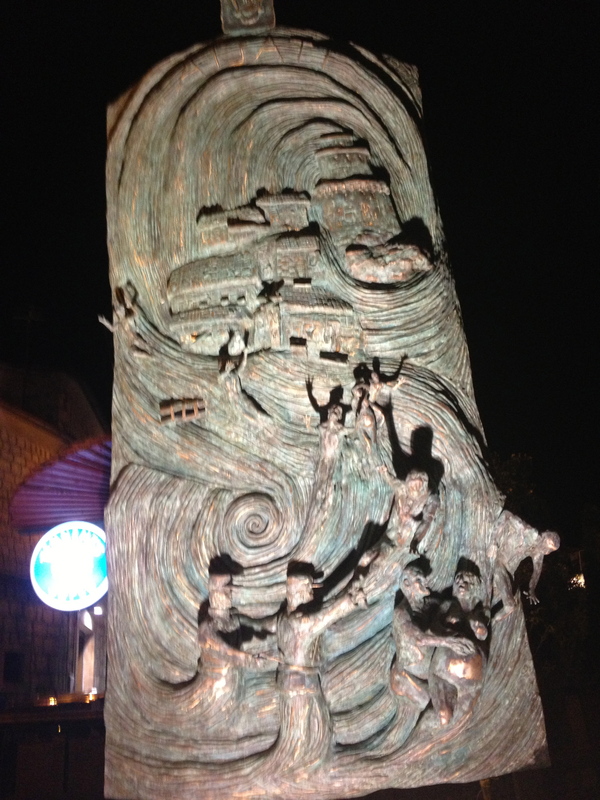 Every night of the celebration of San Donato there is something. (Could any of you good Catholics out there tell me what he is the special saint for? I spent an hour searching and couldn’t find anything related to this part of the world. One of the elders said that he was instrumental in stopping the plague here but that is all I got.) Here is this year’s line up. Tourists are already trickling in. 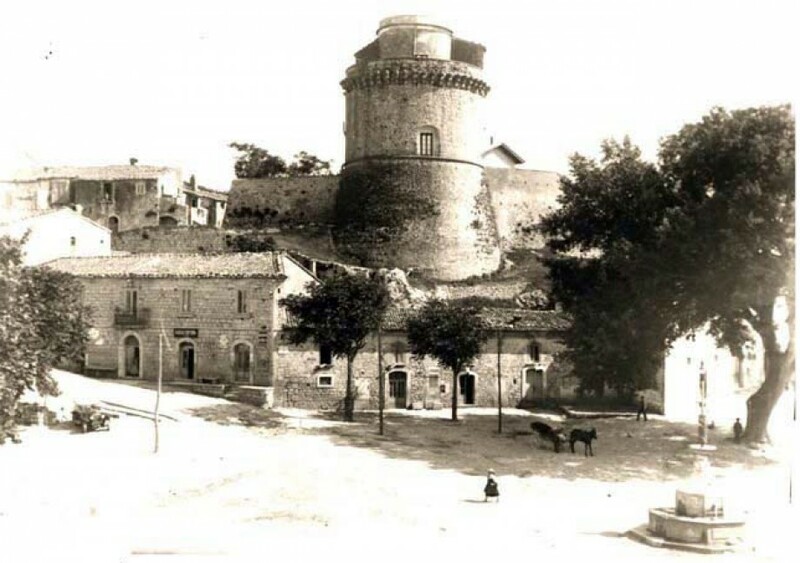 Yesterday, I was standing at a bar having a caffè when a woman speaking the ancient dialect of the village – the first clue that it is an out of towner who had elders from here – picked up a candy and asked me if it had sugar. She couldn’t read the Italian. I asked her in English if she was American. She said, oh you don’t speak Italian. I responded in Italian that one candy didn’t have sugar and could I read the other. Are you proud of me? She and her husband were from Buenos Aires, Argentina. A good number of Pontelandolfesi immigrated to Argentina. Today is Wednesday – market day – and I noticed a good number of folks I hadn’t seen before. One visitor, who was driving and staring at the vendors ran smack into a parked truck. Ooops! I’m told that many people come during festa time to visit their relatives. Not a bad idea! I tried to convince mine to come but didn’t have any takers. 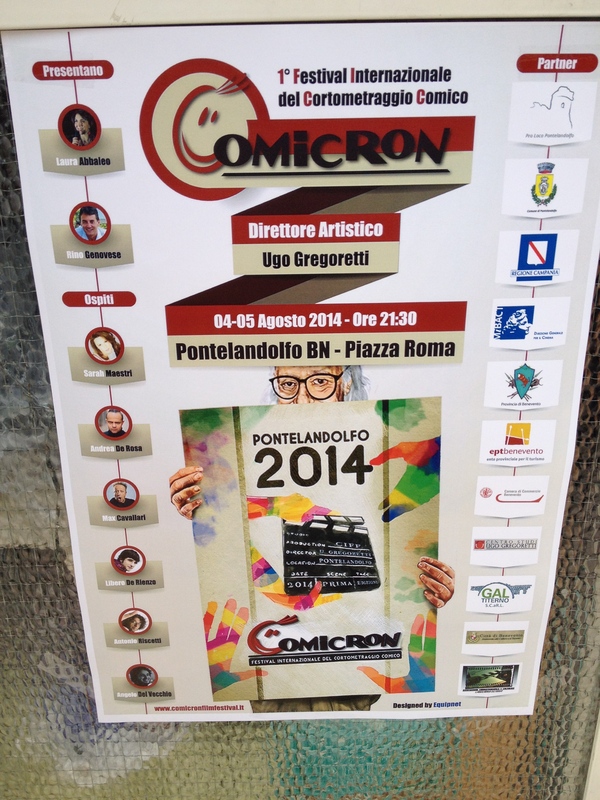 With help from the producers and production companies that are providing the shows, Pontelandolfo is really trying to promote the events. Last Monday, July 28th, as part of the television program “UNOMATTINA Summer” on Raiuno the hosts interviewed the artistic director of the Award program “Hugh Gregory – Landulf d’Oro” (scheduled for July 31) and “Comicron”, the first international festival of short comedic films scheduled on August 4 and 5. That my friends, brings this year’s festa national attention. I’m hoping tons of people come and all of the businesses make a little extra money. In this time of economic struggling, I kept asking folks who the hell was paying for all this. Everyone said, we are! I didn’t quite get it until two business owners explained it to me. A committee went door to door asking every citizen for a donation. Hey, as I used to tell my Arts Management students, it doesn’t hurt to ask. Folks are so proud of the festa that the majority gave what they could and were rewarded with a flier that listed the events. To be a sponsor and hang a banner cost about €200 per business. In other years, I’m told, it cost €500. Bottom line, everyone contributed to the best of their ability. Putting the finishing touches on the huge stage. I’m excited to see and hear everything that will be going on. Of course nothing starts before 9:30 PM so a nap is important. Keep your eyes peeled because everyday, unless the late night partying is just too much for me, I’ll write a post about the event of the day. Please, please send me energy so I can send you stories! See you at the Festa! I had been coughing for three days – you know that deep you can’t sleep barely move kind of coughing. The ever wonderful Carmela Fusco insisted I visit the doctor. Last Wednesday morning she pushed me up the stairs to the doctor’s office. After the visit and a trip to the farmacia to pick up antibiotics etc, we sat down at Bar Mix Fantasy for a cappuccino and a cornetto – I needed food in my stomach in order to take the pill. I looked like hell, red nose, dirty hair, don’t touch me I’ll kill you look on my haggard face. OK, you got the back story? As I sat staring, my head so congested I can barely hear, breaking through the clogged head barrier comes “Sei tu Midge?.” I glance over my right shoulder to spy a tall distinguished gentleman looking down at me. “Si” I reply, “Sono Midge.” Carmella smiled at him and said “Ciao Renato”, so I knew we were OK. I often read the Pontelandolfo News to find out what is going on locally – from politics to real estate. It contains link to news articles on other sites, info on local businesses, reports on government and well, lots of material on Pontelandolfo. I was incredibly flattered and touched to receive this huge book. It represents years of research and editing. 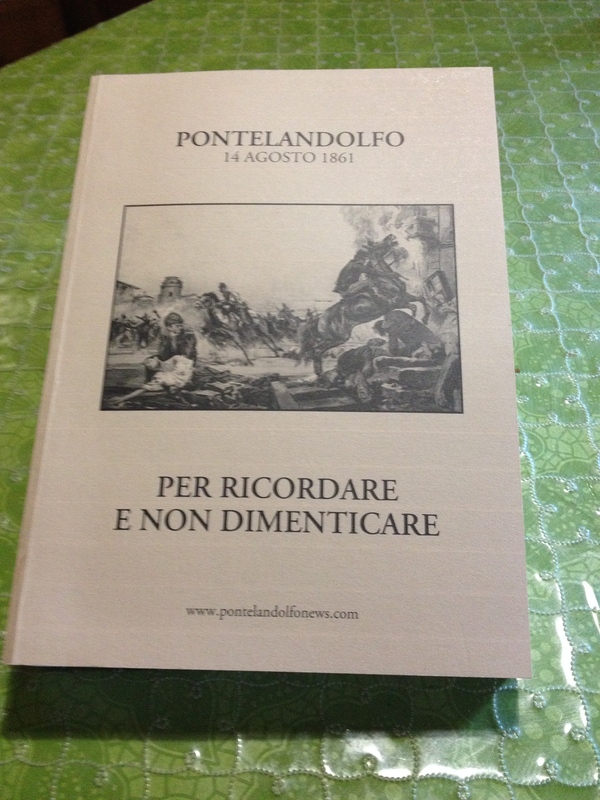 As the editor, Prof. Rinaldi has created the ultimate compilation of documents that recount the heinous burning and mass murder of Pontelandolfesi on August 14, 1861. Last year the young theater folks of Pontelandolfo staged a venue specific theater piece and frankly, that was the first time I truly understood the story of Il Brigante. Poster from last year’s show. The work included more than just the massacre story. Not all parts of Italy welcomed the idea of “risorgimento” – unification as one country. Frankly, the south wasn’t all that interested and it was only the heavy handed military actions that induced their cooperation. One such incident occurred on August 14, 1861. 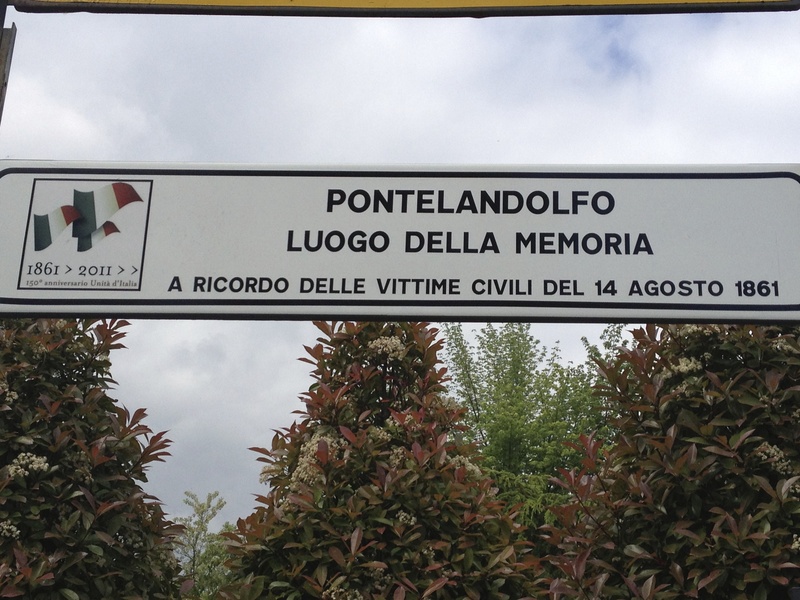 Pontelandolfo and the neighboring Casalduni were attacked – some bad folks had killed a few members of the army and the army took its revenge. The citizens of Casalduni had a little warning and fled. 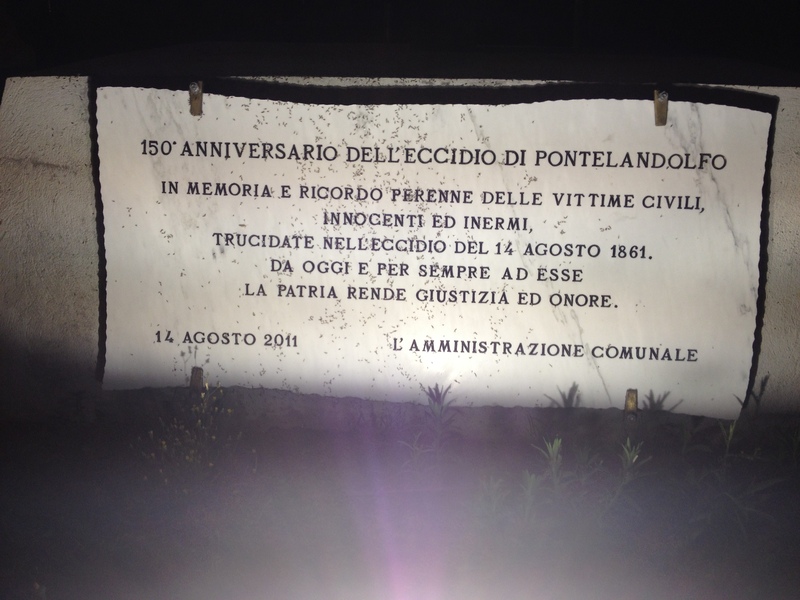 The attack on Pontelandolfo occurred in the dead of night. Gun bursts and fires waking up the town. It is said that about 3,000 men, women and children were mutilated, raped and murdered. The entire town was burned to the ground. We will do a full story on this when I’ve had a chance to read Rinaldi’s thorough collection of essays and historic documents. Prof. Rinaldi was sharing his insight into this history with me, but I was having a difficult time understanding. My head still spinning with the bronchitis. He gave me his card and offered to meet with me again. He also said he would share some historic photos with me. I can’t wait to sit down with him. Prof. Rinaldi took my miserable morning and turned it into a wonderful Pontelandolfo experience. I thank him for that and his generosity.